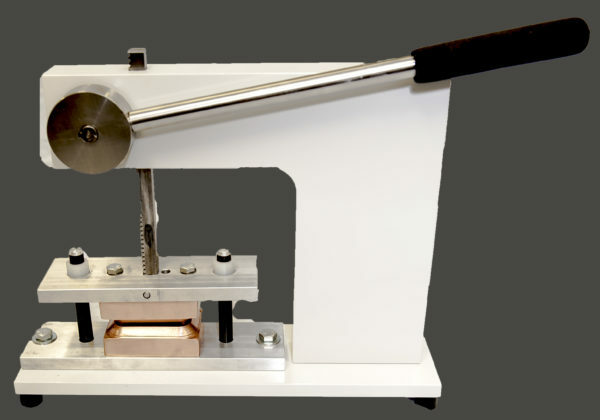 The model LS-H is a bench top soap press used for stamping small bars such as those made on the LE-2 and LE-2.5 machines. This machine is completely hand operated and exerts approximately 750 pounds of force. The model LS-H is a bench top soap press used for stamping small bars such as those made on the LE-2 and LE-2.5 machines. This machine is hand operated and exerts approximately 750 pounds of force. It is useful for evaluating small bars for general appearance but not recommended for producing bars which must stand up under a “wash-test”. The LS-H can be affixed to a table top with bolts or alternately can be temporarily fixed with an optional clamp.